The true taste of East Kent.No 3 premium pale ale. This Kentish Pale Ale is brewed simply with pale malt & goldings hops grown on Humphrey's farm, just down the road. 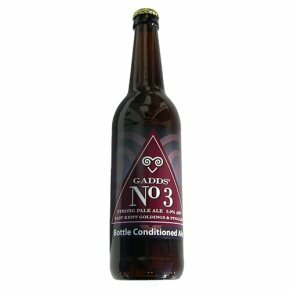 GADDS' No 3 Kent Premium Pale Ale is brewed & bottled, with great TLC, by Lois, Eddie & the gang of miscreants they employ at their Ramsgate Brewery on the Isle of Thanet, on Kent's eastern coast (CT10 2YD) where gulls sing and hops grow wild. The ingredients used are: water, malted barley, malted wheat, Kent hops & brewers' yeast.